Adriaen van der Werff (Dutch, 1659–1722). Self-portrait with the Portrait of his Wife, Margaretha van Rees, and their Daughter Maria, 1699. Oil on canvas. Rijksmuseum, Amsterdam, SK-A-465. In the first part of this post, using the Milwaukee Art Museum’s painting Doubting Thomas, we explored the biography and style of Dutch artist Adriaen van der Werff (a self-portrait of him from the Rijksmuseum is to the left). This week, we’re going to trace the provenance of Doubting Thomas and see what it tells us about the history of taste in art and trends in collecting. Van der Werff was one of the most famous painters of his day and was known internationally throughout his career. He was in demand in his earlier career for his rich portraits in the popular “Fine School” style. One example of his early work is the 1685 painting in the National Gallery, London called Portrait of a Man in a Quilted Gown. Then in the 1690’s van der Werff’s paintings became more and more influenced by the classical style admired in France. He already had a tendency to use richer detail and elegant lines in his Fine School paintings. An important reason for this transition is the fact that the new style was preferred by patrons in the late Baroque period. If you want to make a living, you paint want people want to buy! This worked handsomely for van der Werff. Just a few of his paintings with aristocratic provenance are Cimon and Pero in the Royal Collection in England, Venus and Cupid in the Wallace Collection, and Nymphs Dancing in the Louvre. Also, in 1697 he became the highest-paid court painter in Europe. He accepted a contract with Johann Wilhelm, Elector Palatine in Düsseldorf. For half of the year, van der Werff worked only for the Elector for an annual salary of 4,000 guilders. Because artists who usually gained commissions on a painting by painting basis, this was a luxurious arrangement. The Elector was so pleased with van der Werrf’s output, that he knighted him in 1703. In fact, the signature on Milwaukee’s painting includes the title “Chev”, which is an abbreviation of Chevalier, the French word for knight. Adriaen van der Werff (Dutch, 1659–1722). Doubting Thomas (The Incredulity of St. Thomas), 1710. Oil on wood panel. 24 15/16 × 18 15/16 in. (63.34 × 48.1 cm). Milwaukee Art Museum, Gift of Mr. and Mrs. R. V. Krikorian M1971.60. Photo credit: P. Richard Eells. 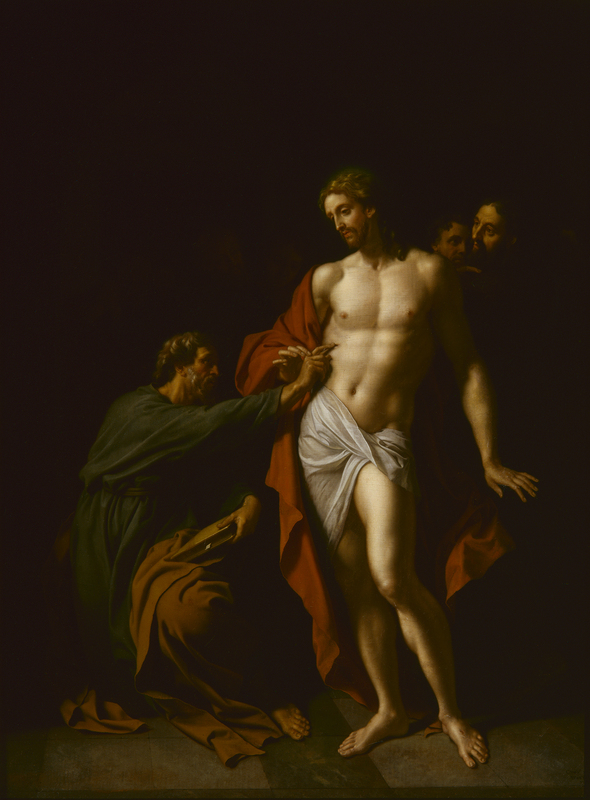 Doubting Thomas is dated 1710, which is before the Elector died. This raises the question: was it painted for the Elector?!? We are lucky enough, however, to have an almost complete chain of provenance back to the artist. We know, therefore, that the painting was not in the collection of the Elector. Instead, van der Werff gave Doubting Thomas to his son-in-law, A. Brouwer, of Rotterdam. Arnold Boonen (Dutch, 1669–1729). Portrait of Gerard Bicker van Swieten, 1700/24. Oil on canvas. Private Collection. Image number IB00055631, RKD Netherlands Institute for Art History. The next documentation on the ownership of the painting is from April 12, 1741, when it was sold from the collection of Gerard Bicker van Zwieten (1687–1753) of The Hague. So, sometime before this date the painting left Brouwer’s collection. Who was Gerard Bicker van Zwieten? You can see a portrait of him to the left. He was a member of a very old patrician family in Holland and an avid art collector. Besides the painting by Adriaen van der Werff, he owned art by Gabriel Metsu (Dtuch, 1629–1667) and Gerri Dou (Dutch, 1613–1675), not to mention Rembrandt (Dutch, 1606–1669). When Doubting Thomas was sold in 1741, it entered another important art collection; it was bought by Jan Bisschop (1680–1771) and his brother, Pieter Bisschop (ca. 1690–1758), of Rotterdam. You can see them in the painting below. The Bisschop brothers had inherited a yarn spinning business from their father and were extremely prosperous. Their art collection was so well-regarded that Prince William V of Orange and wife paid a visit in 1768. The Prince was himself a serious art collector, so he knew a good collection when he saw it! Also, when in the Bisschop collection, Doubting Thomas was noted by French writer Jean-Baptiste Descamps in his monumental La Vie des peintres flamands, allemands et hollandais (The Lives of the Flemish Painters, German and Dutch). The entire Bisschop collection was bought in 1771 by Adriaen Hope (1709-1781) and his nephew, John Hope (1737-1784). The Hopes, who had become one of the richest families in Europe through banking, were the preeminent collectors of art in Holland. John Hope retained the art collection when his uncle died in 1781. Upon his own death, John left everything to his wife. When she herself died, John’s cousin Henry Hope (c. 1739-1811) took in their three sons and oversaw the estate, including the acclaimed art collection. A portrait of Henry Hope is at the very bottom of this post. Henry Hope fled for London in 1794 before French revolutionary forces occupied Amsterdam during the French Revolutionary War, taking 372 paintings with him. Just some of the artists represented were Frans Hals (Dutch, ca. 1581–1666), Peter Paul Rubens (Flemish, 1577–1640), Rembrandt, and Sir Anthony Van Dyck (Flemish, 1599–1641). Aert Schouman (Dutch, 1710–1792). Portrait of Jan Bisschop, Pieter Bisschop, and Olivier van Vlierden Hope, 1753. Private Collection. Image number IB00075837, RKD Netherlands Institute for Art History. The wealth and art collection remained in the Hope family, now living in England. In 1833, our painting was published in John Smith’s A Catalogue Raisonné of the Works of the Most Eminent Dutch, Flemish, and French Painters (with the title The Incredulity of St. Thomas) as part of the collection of Henry Philip Hope (1774–1839). Henry Philip Hope had inherited the collection by this time, but it was in the possession of his brother, Thomas Hope (1769–1831). Eventually, the painting came to Milwaukee through art dealer Dr. Alfred Bader, who sold it to local collectors Mr. and Mrs. Robert V. Krikorian. The Krikorians gave the painting to the Milwaukee Art Museum in 1971. Charles Howard Hodges (English, 1764–1837), after Sir Joshua Reynolds (English, 1723–1792). Henry Hope Esqr of Amsterdam, 1788. Mezzotint. The British Museum 1840,0808.75. © Trustees of the British Museum. So, don’t you think that this long list of illustrious collectors, publications, and exhibitions proves that for centuries Adriaen van der Werf was a sought-after, well-respected, and highly valued artist? What may surprise you, then, is that despite the esteem art collectors showed for van der Werff, and although the painter had great skill and knowledge of the history of art, his reputation among critics bottomed out quickly after his death. For example, the well-respected German art historian Gustav Friedrich Waagen included Doubting Thomas in his 1854 publication Treasures of Art in Great Britain. His writes that it is “very delicately blended, and rather warmer in tone than most of his performances.” In other words, he isn’t impressed with most of van der Werff’s paintings! What explains this harsh reaction to van der Werff’s paintings? Stepping back for a moment, I think we might be able to understand. For the critics and art historians of the late 18th and 19th century, van der Werff was a contrast to the lively and painterly style that was used by those dubbed the masters of Dutch golden age art of the 17th century. Put a van der Werff side by side with a Rembrandt, and you can see how van der Werff comes off as static and cold. The taste for the classicizing style appealed to wealthy collectors not only because of its decorative sensibilities (long, curvilinear lines), but also because to fully appreciate the painting you need to understand the source material (the French artists and the ancient and Renaissance sculpture that in turn inspired them). In short, to get it you had to be of the educated upper class. But it is important to realize that the study of art history has been, and to a certain extent always will be, led by the tastes of the time. Lots of artists and periods of art have fallen out of favor just to be rediscovered and extolled. One only has to look at the resurgence of Victorian art to see this. This is why a study of provenance is so important to understand an artwork completely: it puts it into a historical context. It tells a story that helps bring the past alive. It encourages us to relook at an artwork that might not be in favor at the moment and ask, why was it made, and how can we appreciate it today? Thankfully, Adriaen van der Werff’s critical reception has been on the upswing since the mid-20th century. And after looking closely at Doubting Thomas and its elegant composition, quiet contemplative quality, and amazing technique, it’s easy to see why. This entry was posted in Art, Curatorial and tagged Adriaen van der Werff, Collection, European art, European Design Since 1985, From the Collection, provenance. Bookmark the permalink. Thanks for this wonderful and detailed history of this beautiful painting which has caught my eye since its installation after the renovation. How fascinating that the same family that once owned it owned the Hope diamond! I look forward to sharing some of your history of the artist with my tours.